When Samsung announced the Galaxy S6 and S6 Edge last year, the new design it unveiled traded functionality for looks. You got a metal and glass device, but at the cost of a removable battery. Samsung also did away with support for microSD cards and the water and dust-proofing it brought to the Galaxy S5. With the introduction of the Galaxy S7, Samsung has corrected most of the missteps it took with the S6. It built on the stunning design of S6 range and brought back support for a microSD card. A better ingress protection rating (IP68) than the S5 was also included. Samsung also refined the S7 Edge, smoothing the edges where the case meets the curved glass of the display – giving a more comfortable grip. The only thing we didn’t get back was a removable battery, but to compensate Samsung made both S7 devices slightly fatter to fit larger batteries in their shells. Neither device has the new reversible USB Type-C connector, and Samsung opted to stay with micro USB connectors partly for the sake of maintaining compatibility with existing accessories – particularly its Gear VR headset. TouchWiz, Samsung’s “skin” for Android, is no longer the eyesore or obstacle it was 3-4 years ago. It now runs on Android 6.0, offering the new permission model that Google added to its mobile operating system. Features such as Samsung’s calendar widget add useful functionality without detracting from features already built into Android. However, one major annoyance still remains – irremovable shovelware. Some of Samsung’s apps, S Health and S Voice, come pre-installed and can only be disabled, not removed. What’s worse is that apps from Facebook and Microsoft also come bundled with the smartphone: Facebook, Instagram, WhatsApp, Word, Excel, PowerPoint, OneDrive, and OneNote. Most infuriating is that Microsoft’s apps will send you notifications if you refuse to use them, as shown below. Samsung Galaxy S7 Edge shovelware and invasive push notifications. Even without the bloatware, the S7 falls short of perfection. The twin curved edges of the S7 Edge’s display will not excite everyone, and those who tell you that the curves offer functional benefits are lying to themselves. You might hear a story about the Samsung Edge slide-out menu, which is cute, but in truth the curves offer little more than the illusion of a bezel-less display. With a display running all the way to the edges of the smartphone, this invariably means accidental touches when you grip the device in your palm. You get the hang of it after awhile, and eventually you won’t touch the screen’s edges while using the device normally. That said, even after weeks with mine I still struggle to type while lying down. Samsung Galaxy S7 Edge – taken with a Samsung Galaxy S7 Edge. Another matter of taste is that Samsung insists on sticking with hardware buttons on the front face of its smartphones. Preferences for hardware or software buttons aside, the rounded rectangular home button and almost invisible capacitive buttons that flank it have become ingrained in Samsung’s design language. It makes a Samsung Galaxy device instantly recognisable and, though I might not like it, there is something to be said for maintaining a level of consistency over the years. 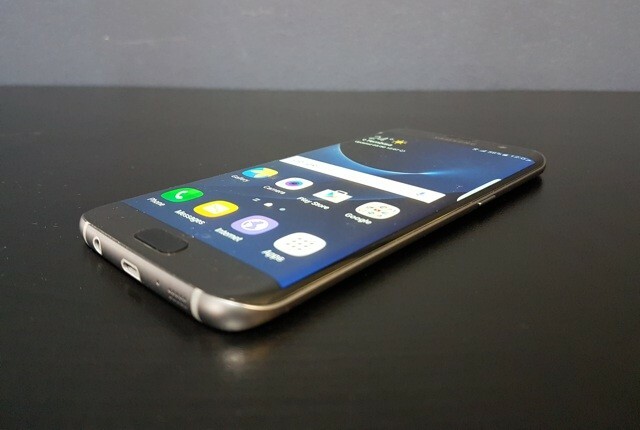 Despite its faults, the Samsung Galaxy S7 Edge is an excellent phone. Magnificent, in fact. Not only is it striking, it is powerful too. A beautiful beast of a device. Unfortunately, the weakness of the rand has caused it to be much more expensive than its predecessor – but if you’re in the market for a new high-end smartphone it is well worth your consideration. Battery life. Good – lasts more than a day under normal usage. Fast charge. Non-removable battery. Display. Good – high resolution, responsive, circular polarising filter, good visibility in sunlight. Storage. 32GB single partition internal, 24.32GB available. MicroSD support for up to 200GB. Network. All LTE, 3G, and 2G networks in SA supported. Cameras. Excellent rear camera. Good front camera. Both have large f/1.7 aperture lenses. Shovelware. Kill it with fire!